ataram in Central Java also born during the reign ofSyailendra dynasty, they built temples such as the Temple of Borobudur, Candi Kalasan Temple, etc. In the 16th century after the collapse of the Hindu Empire Majapahit, Kingdom of Islam appeared in Demak, since that's the Islam spread in Central Java.After the Kingdom of Demak collapsed, joko Tingkirson-in-law King of Demak Kingdom of Demak andmove onto Post. And declared himself King of the Kingdom of Pajang, Sultan Or title. During his reign was a riot and rebellion. The great war was between the Sultan Or against Aryo Penangsang. Sultan Or assigning Danang Sutowijaya rebelion Aryo Penangsang and successfully kill Aryo Penangsang. Due to the great merit to the Kingdom of Pajang, Sultan of Mataram Or give a gift of land to the Sutowijaya. AfterPost collapse he became the first King of the Islamic Mataram in Central Java and had the title of Panembahan Senopati. In the middle of the 16th century the Portuguese and Spain came to Indonesia in an effort to find spices that will trade in Europe. At the same time, the United Kingdom and then the nation Netherlands came to Indonesia as well. With his nation the VOC Netherlands oppressive nation of Indonesia including the people of Central Java is good in the field of politicsas well as economics. At the beginning of the 18th century the Kingdom of Mataram was ruled by Sri Sunan Pakubuwono II, after he died appear dispute between the King familywho wants to choose a new King. The dispute grewmurky after the intervention of the colonial Government of Netherlands at the King family strife. This dispute was finally settled by the Treaty of Gianti year 1755. Kingdom of Mataram split into two smallerkingdoms i.e. Surakarta Hadiningrat or KasunananSurakarta Kraton Ngayogyakarta Hadiningrat and orthe Sultanate of Yogyakarta. Until now the Central Java area administratively is aprovince defined by law No. 10/1950 dated July 4, 1950. As one of Central Java Province in Java, flanked by two large Provinces, namely West Java and East Java. Administratively, Central Java province is divided into 29 districts and 6 towns. Than other forms, House joglo, better known forms of society in General. Joglo House mostly just owned by those who can afford. because joglo House need more materials and expensive than homes in other forms. First consider that Javanese joglo House should not be owned by any person, by most people, but only allowed for the nobility, Kings, and princes, as well as those who are honored and celebrated. However nowadays joglo House used by all walks of life and also for various other functions, such as meeting and office space. Basically the House joglo squared shape of squares, with four principal pillars in the middle which is called saka guru, and is used in the call to compile blandar intercropping. This rectangular shape in the process changes with the additions of space at the side of the building however remains a unitary formof rectangular floor plan. Some of the Central Java is a building in Surakarta, Mangkunegaran Palace stem. Houses and palacesin Central Java generally consists of 3 rooms. Pendopo. Pringgitan, and Servants. The dance is part of accompanying the development of this new Centre. It turns out that at the time ofthe Kingdom of dance first reached a high aestheticlevel. If folk dances in the spontaneous and simple, then in the dance Palace environment standards, complicated, subtle, and symbolic. If the review of aspects of the motion, then the influence of dance India dance found in the palaces of Java lies on the position of the hand. 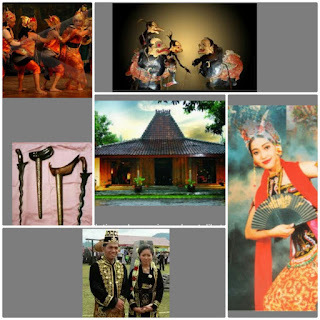 The famous dance creations of the King, especiallyin Java, is a form of Dance Theater such as wayang wong and the bedhaya piece. Two of this dance is the inheritance of the King of Java. The piece is thebedhaya dance that was created by the King of Mataram third, Sultan Agung with diversity of romancebetween the King of Mataram Kangjeng Ratu Kidulby first. * Serimpi Dance, a dance Palace in time with a gentle, great atmosphere and charming. * Dance Blambangan Cakil, deals with the struggleagainst Srikandi Buto Cakil (giant). A symbol of the crackdown angkara (evil) wrath. Wayang in its original embossed before Indonesia'sHindu culture and began to develop during the Hindu Javanese. Puppet performances are the remains of the religious ceremonies of Java i.e. the remnants of animism and dynamism. According to the book, on the origin of Centini wayang Purwa mentioned that puppet, firstly invented by King Joyoboyo of Kediri Kingdom. In the 10th century King Jayabaya attempted to create a picture of the spirit of his ancestor and digoreskan on top of the leaves as well. The form of the puppet picture copied from the description of the relief of Ramayana story on Candi Penataran in Blitar. The Ramayana story very interesting attention because Jayabaya including worshippers of Vishnu who is loyal, even by the community is considered as the incarnation of Lord Vishnu or avatar. Figure of the personage depicted for the first time is Batara Guru that is the embodiment of the God Vishnu. Ketoprak is one of the folk art in Central Java, but can also be found in the eastern part of Java. Ketoprak already fused into the culture of the community.ketoprak is a kind of performance art that originated in Java. In a pentasan ketoprak, a play that is interspersed with songs, accompanied by the gamelan is presented. The theme of the story in a show ketoprak assortment. Usually taken from history or legend. After thatperformance the longer Ketoprak makin so good and became the idol of the people, especially on the ground. in a show of complete so Ketoprak with stories and also accompanied by gamelan music. Kris is one of the traditional weapons of the Indonesia culture, certainly after our ancestors know iron.Various stone temple building built in the days before the 10th century proves that the nation of Indonesia at that time had known iron equipment is pretty good, so that they can create works of sculpture that is high-value. But whether when that nation Indonesia Kris culture as we know it today, most ancientrelief Image showing the equipment of iron found instone inscriptions were found in the village of Dakuwu, in the area of Grabag, Magelang, Central Java.See the form of his writings, it is estimated that the inscription was made in around the year 500 ad. The letter is used, the letter in Pallawa script. The language used is Sanskrit. The inscription mentions the existence of a spring water that is clean and clear. in the philosophy of Ancient Javanese is the symbolSciences, kalasangka symbolizes eternity, while theLotus flower symbol of harmony with nature. Custom clothing Central Java name is kain kebaya,Central Java Custom clothing image and caption please see explanation below. The island of Java is one of the Islands with a population of the most populous and diverse cultures there are inside. After yesterday I wrote about the culture that existsin Riau and about custom clothing Western Java, now let us discuss about custom clothing Central Java. In Java there are various indigenous pakain imposed in event penikahan nor in other customevents. Clothing is clothing suit fabric cloth, kebaya kebaya which is in Central Java are different motives than kebaya from Yogyakarta as well as other areas. Usually that sets it apart is in batik motif and modelsettings how to use cloth kebaya. If seen at a glance, Central Java Custom clothing is identical with the use of fabrics with kebaya batik motif, where batikbatik is used which still belongs to the original. All kinds of custom clothing Central Java as seen in the picture above is the ancestral cultural heritage that we should lestarikan and become the pride of the nation of Indonesia especially Javanese. 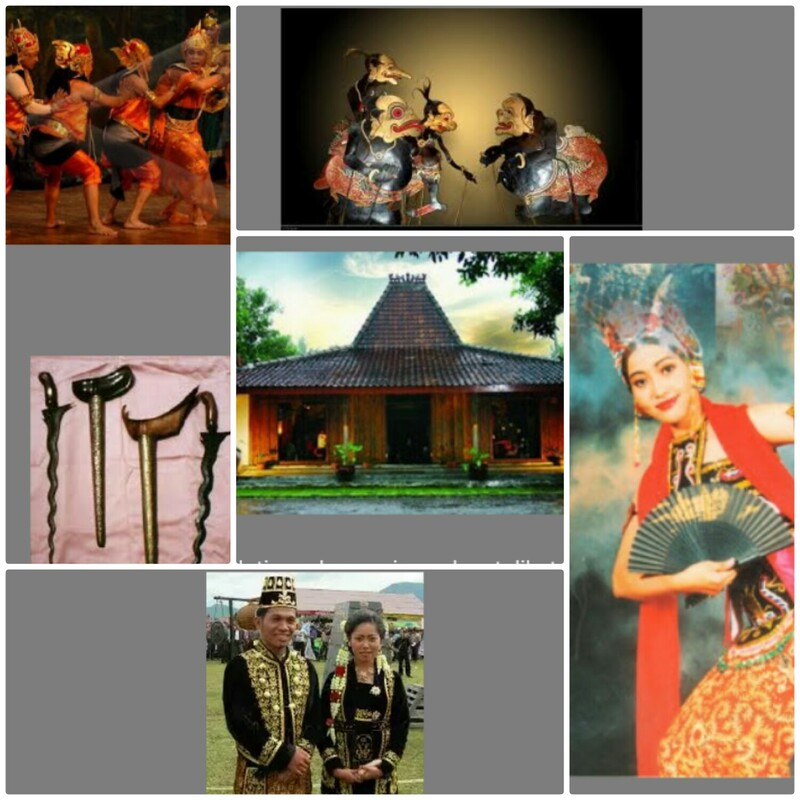 0 Response to "Culture Of Central Java"